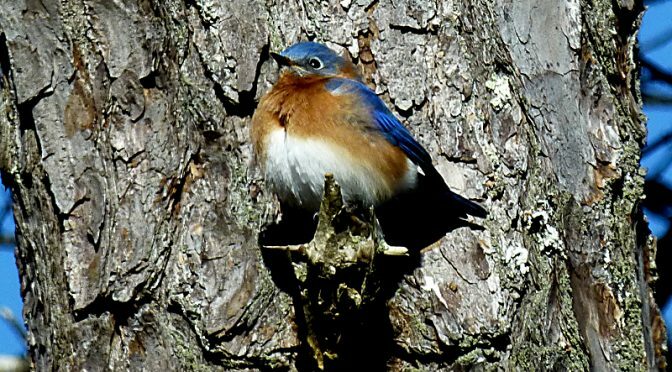 Beautiful Little Eastern Bluebird Keeping Warm In the Sun In Our Yard On Cape Cod. When the sun gets higher in the sky, about mid-morning, the Bluebirds like to find a little branch in the sun and bask in the warmth. Sometimes you can see Bluebirds on many of the little branches way up high in the sun. This guy was about 30 feet high in the tree and there were probably 4-5 other ones on nearby branches enjoying the warm sun. This little Bluebird was all puffed up up trying to keep warm in the cold, cold weather that we have been having! Previous PostSunset Through The Beach Grass On Cape Cod Bay.Next PostGorgeous Clouds At Fort Hill On Cape Cod!